The truth is that the folks at HG are sincere lovers of games who wanted to be transparent, but in their inexperience, they weren’t being transparent about their plans and the game’s features; they were being transparent about their vision and the game’s possibilities. The thing that big gaming firms know is that while, yes, their outreach is really just exceptionally well-crafted marketing, they must also be very, very careful not to talk about anything that isn’t “locked down.” The reason for such caution is this: Anything they say becomes a promise. Even if they cram their statements full of caveats, gamers filter them out. For example, if they said, “Eventually, our goal is to include such possible features as the ability to leap tall buildings in a single bound,” the only sure outcome is that, come Release Day, gamers will fully expect to be able to leap tall buildings in a single bound, and if they can’t, they will trash you through Reddit and Twitter with all the fevered fury of a rabid raccoon on meth. 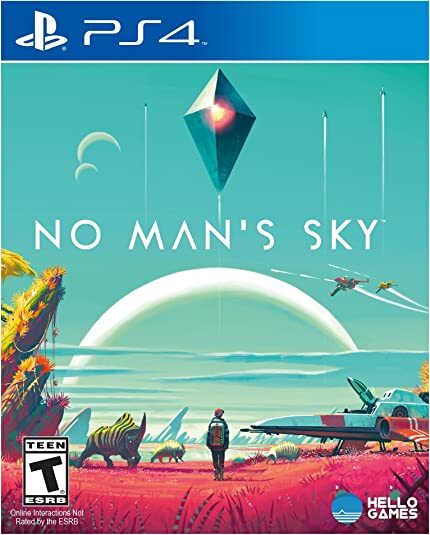 The result of all the NMS excitement is a game that doesn’t have a hope of living up to its hype, a hype that had been further distorted by my own imagination’s total buy-in. Ah, me. First world problems. However, after a fortnight of NMS play, I would have to describe myself as only mildly disappointed (though that’s after some post hoc recalibration of my previous expectations). The artwork, the seamlessness, the intuitive learning curve, the power balance, the sheer scope, all these elements are precisely as expected and they get top marks. Where disappointment creeps in, is via the repetitive nature of the one thing that sets this game apart: the much-vaunted procedural processes. Yes, every planet I’ve explored — about forty, at last count — is unique, but it is unique within constraints, and it is these constraints that engender my disappointment. After exploring several star systems, it’s easy to see the templates beneath the details, and for a game that boasts a possible 18 quintillion worlds, the number of templates in use is shockingly limited. Similar flora crop up on multiple planets orbiting different stars. The biology of each planet is different, sure, but I have yet to encounter a jungle, a forest, a broad expanse of desert, a grassland, a tundra. I’ve seen not one volcano, geyser, or hot spring. Shorelines have no beaches. Oceans have no waves. Moreover, planets exhibit no seasons, no climate zones, and no variation of flora, fauna, minerals, or topography across their vast, fully explorable terrains. They are Mandelbrot figures, capable of intense detail and differentiation, but ones that have been seeded from only a dozen or so models. Variation is present, but limited. And that’s the part that’s unique. When it comes to manufactured items — shelters, observatories, outposts, stations — there is no uniqueness. All structures look the same (though the potted plants in the lobby might change). All observatories have one of the same five puzzles to solve. All stations have the same internal layout. And then there’s what’s missing. A story. I was surprised to find that I missed having a storyline. The only elements that function as a possible story are (a) head to the center of the galaxy, and (b) find the Atlas outposts. Both of these elements are vague, and neither have a defined purpose or goal; they’re just activities with an implied motivation: See the Universe! Sadly, that’s just not enough for me. I’ve often complained about the stilted, contrived nature of “side missions” and “story lines” in other open-world games, and I don’t want them in NMS, but (without knowing it) I find I was still hoping for some sort of story or implied purpose, something that would motivate me to check out the next planet, warp to the next star system, or investigate that anomaly on my star map. Unfortunately, it turns out that “mild curiosity” isn’t much of a motivator, or at least, isn’t enough of one to drive me forward through hours and hours of gameplay. Neither is just wanting a bigger, faster, stronger, more adaptable ship/exosuit/multitool. I do like the game. I just don’t love it. And I really, really wanted to love it. on 23 Aug 2016 at 12:18 pm | Reply A.J. Your experience with the procedurally generated content pretty much matches what I’ve seen historically… I’d still like to check it out at some point.